The pottery studio has been quite secondary lately because I have had some complications after the cesarean section and have gotten sick several times in the past three months. 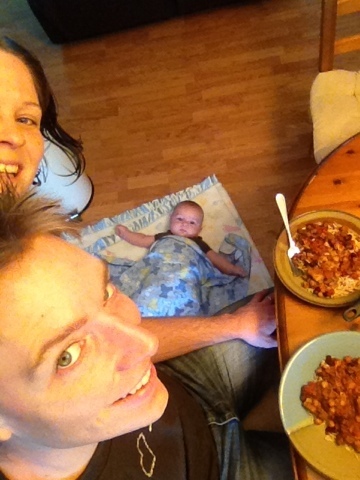 We had prepared as best we could with freezing extra meals and keeping a very simple life of sharing chores and diaper duty. I got sick again a few weeks back and texted my sister that I was having an emergency surgery later that day. We have a system in our family that if one of us has important news they can let one person know and that person will let the others know. I am the youngest of five kids. The surgery went well and I sent another message to say I was out and back at home to recuperate. It was really stressful trying to restart the breastmilk and hard to relax when we had been sick and felt better so many times only to get sick again. I got a text from my sister that she would catch a flight from Edmonton in a week and come help out! She could only stay a week as she is taking a course at U of A so she planned to make the most of the time she had and started a shopping list and brought recipes with her. I didn't know what to say to such a generous offer and I was a bit unsure of how she would adapt to life with a baby in the house. I went to pick her up and laughed that we almost couldn't put her luggage in the car with the dogs and the child seat. We stopped off at the grocery store on the way home and filled out her shopping list. Before dark that first day she had roasted three chickens, one huge ham, yams, and made a slow cooker of chilli. It was stunning to see and if she wasn't stirring something's she was holding Ethan while I rested of had a shower. 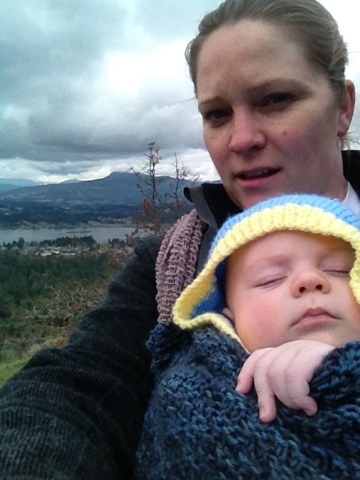 The week went by very quickly and hit the climax when she and I hiked up to the first lookout on Tzouhalem with Ethan. The last day she was here we hiked up Cobble Hill and had such a great chat then went to Drumroaster for snacks afterward. She held Ethan through coffee and he was so relaxed in her arms that he fell asleep before we could get him to the car. Daddy Dave has always wanted a minivan and the rule was that we weren't getting one because we didn't have kids. We had our little giant in November and tried to buy a carseat for him prior to his arrival which, of course, would be in the rear facing position. We had to purchase one to take it outside and see if it would fit in the car. It did not, so we had to take it back a few minutes later. W finally floundering one that would fit in the car and ended up taking the little guy home in it but found it a bit hard to clip him into. We moved the straps to the largest settings and Ethan grew too large for it when he was five weeks old so we were again looking for a carseat. He has been in a large carseat for a few months but that meant that in our car either of us could just barely fit in the seat directly in front of the kids seat. This amused my sister and she and Dave hatched a plan for us to go test drive vehicles while Morgan watched Ethan. We found a good deal, and excellent interest rate and a very generous trade-in for the car and brought home a minivan. It was quite easy to feed the baby and then pop out for errands with her here and I could be very relaxed that if I was needed back before I was due back, she would text me and I could return ASAP. Since she left, we have been eating a lot of the approximately 75 meals that she made for us and appreciate each one. 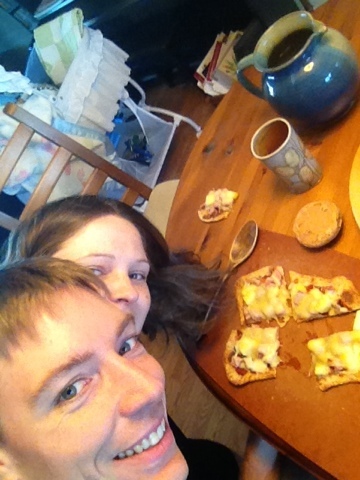 We are sending cute photos of us eating as often as we can via email with a note of thanks. It is such a sweet feeling to be loved and cared for by someone who really didn't have to fly out here and whip up a plethora of food, in just the right sized frozen portions.